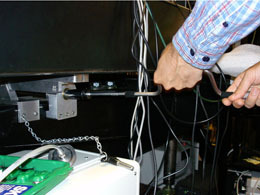 The detector can be brought up to essentially room temperature (in order to gracefully shut it down or do other work on it) or brought down to -40°C (to minimize detector noise for data collection) using the “Quantum Console” program on the detector computers. This figure shows a fairly typical screen image on the detector computers. In the image shown, the “REMOTE Detector OP” program is already running (as a DOS window). If this program is not running, it needs to be run before the Quantum Console can control the detector modules. The shortcut to the program is highlighted by one of the white circles. Once the “REMOTE Detector OP” program, hereafter the detector program, is running on all nine modules, you can control the detector temperature by running the Quantum Console program on any one of the detector computers. The shortcut for this program is highlighted by the other white circle. This window actually shows a temperature-change operation that is already under way, but all the essential parts are visible. If all is as it should be, setting the temperature is fairly simple. To cool the detector down for operation, click “Ramp to Cold Operating Temp”. To warm it up, click on “Warm up Detector to +10°C”. Either one will gradually bring the detector to the desired temperature. Shifting by the whole range from +10°C to -45°C, in either direction, generally takes about an hour. Unfortunately, it is occasionally necessary to restart the ADSC detector along with the associated software. This will summarize how that is done. We will assume that everything is up and running at the beginning of the process; starting when some component or other is down is essentially the same. We’ll assume that this is only a short interruption and that we don’t have to worry about the detector vacuum. Once the detector is warmed up, it can be shut down at the power switches —- it is not necessary to shut down the detector processes or other software first. Turn the detector power switches (the green switches highlighted by the arrow) off from top to bottom. The main power switches should be turned on starting with the bottom power module, then the middle module, then the top module. The order does matter. echo -n "$module restart "
Check Helium tank outside of hutch to make sure it is full and that it is flowing into the shutter box. It is important to purge all air from the shutterbox as the ion-guage needs to report a consistent value. 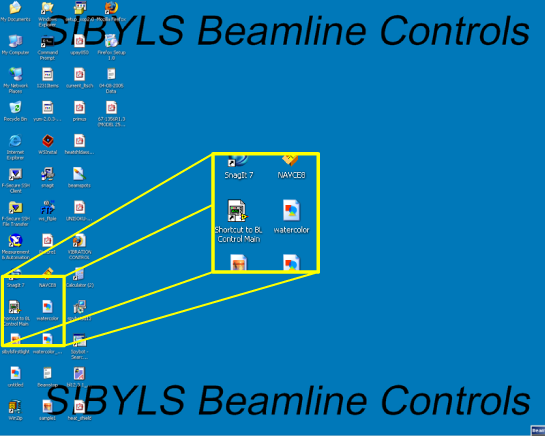 Switch KVM to the Beamline computer, and launch "Shortcut to BL Control Main". Click the white arrow in upper left of main window. This will open the "Beamline 12.3.1 Beamline Control System" window. 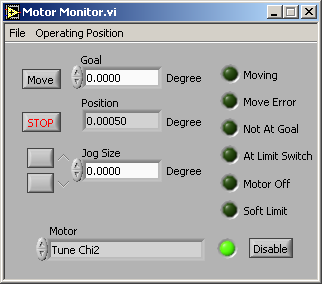 Open bothe the Motor Debugger and Motor Monitor modules from the "Motors" pulldown menu. 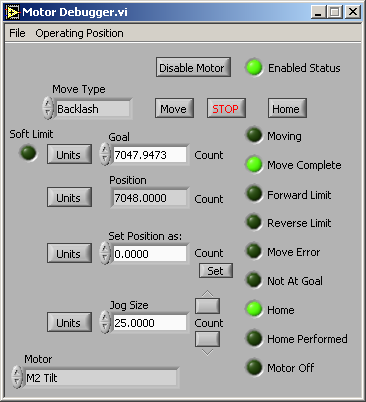 Set M2 Bend Up to 244000, and click move button. Set M2 Bend Down to 267000, and click move button. Change "Mono eV" to 10000. Remove the safety pin and use the hand crank to move the table to the mid point. There is a piece of red tape marked in pen "YAG" indicating the proper midpoint position of the table. Attach the BNC cable to the camera that monitors the YAG prism, and focus the camera (this step will hopefully be unnecessary once a more permanent camera position is established. Open the main shutter. You should see the direct beam hitting the YAG prism at this point. Move M2 Tilt to 12000. Some PX users will have adjusted the Slits1 to make a very tight beam so they should checked and backed off if necessary. Aperture Line 1 and Aperture Line 11 values should be decreased several unit values. If you lose the beam jog M2 Tilt in 100 unit increments (this should move the beam up and down on the video monitor). Select "Chi2" (value should be ~0.492) jog Chi2 in 0.01 increments. (this should move the beam left and right on the video monitor). Because Chi2 is adjusting the focus of the beam changes to this value will drastically alter the shape of the beam. Sometimes the table will need to be moved slightly in order to position the beam in the middle of the YAG. Additionally the shutter control cable may sometimes get in the way so it must be unplugged from the shutterbox. Turn off power on shutter control box and unplug cable. Close hutch and turn off hutch light. Open main shutter and make sure video monitor is turned on. Optimize the shape and size of the beam. You want it as round and small as possible. Make small adjustments to both Chi2 and M2 Tilt. Move the table all the way into SAXS mode using the hand crank. There is a digital dial attached to the air table's sub-frame. Crank the table until this value reads zero. Re-attach the shutter control cable to the shutter box and turn on the power to the shutter control box. Press the small red button on the shutter control box to really turn it back on. Close hutch and open main shutter. Make sure that the video signal going to the beamline computer is displaying the Beam Position Monitor (BPM) video-feed from the camera that points into the shutter box. The point here is to move slits1 (Aperture guys) and slits2 (SAXS aperture guys) and slits3 (Guard Slits guys) back in as far as possible without actually clipping the beam. Jog M2 Tilt to move the whole beam slightly up. Make sure the High Voltage control unit that feeds the ion guage in the shutterbox has not been tripped. If it has been tripped then reset and increase voltage to as close to 300V as possible. Close all four slits1 blades as far as possible without clipping beam. Close all four slits2 blades as far as possible without clipping beam. SAXS Aperture Upper moves in from the bottom... huh? SAXS Aperture Lower moves in from the top... huh? 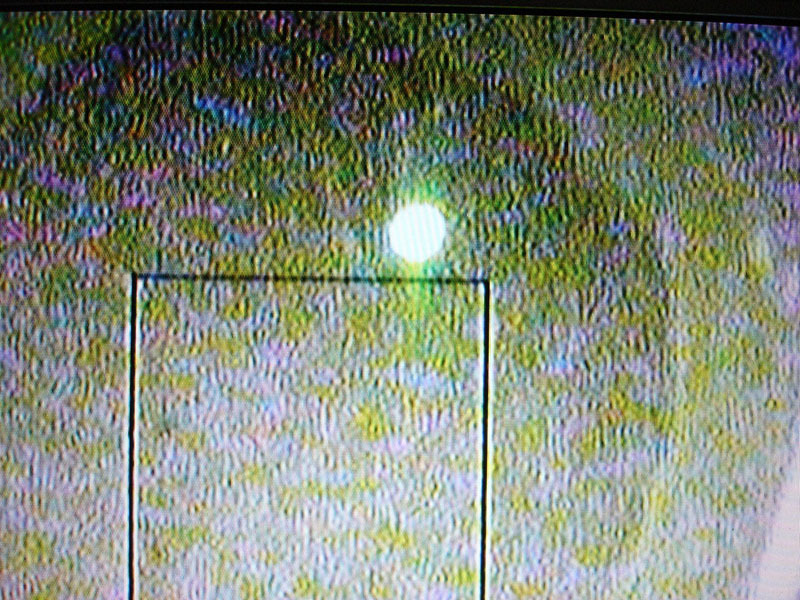 Insert all filters into direct beam and take a 1sec shot on the MAR CCD. Close all four slits3 blades as far as possible without clipping beam. Guard Slits Upper more + values to close blade down. Guard Slits Lower more - values to close blade down. Adjust Endstop y to move the beamstop up and down. Adjust Endstop x to move the beamstop left and right. 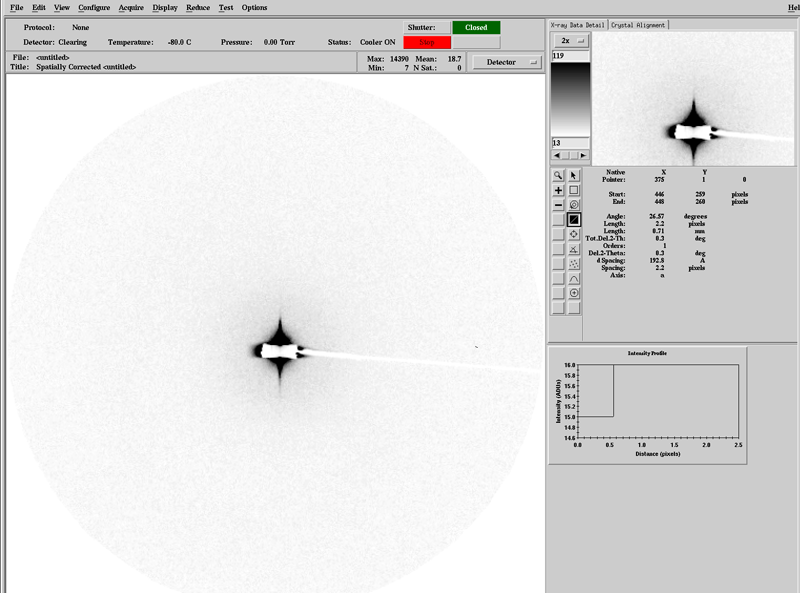 Center the beamstop by observing a line integration tool drawn though the beamstop. The idea is to get a symmetrical background scatter aboce and below the beamstop shadow. Enter hutch. Manually open the experimental shutter. Insert CCD shield. Insert sample cell with fluorescent paper. Close hutch. Open main shutter and define the bounding box for the beam on the video monitor. It may be necessary to move the sample up or down (Sample x and Sample y) so that the beam enters the sample cell in the center. Enter hutch. Close experimental shutter. Remove CCD shield. You are now ready to CRUSH!!!!! The sample cell takes 24 - 30 uL. 30 uL is safer when using the robot. Please download and fill out this mandatory shipping form before sending your samples. It should be included with all samples sent to the SIBYLS beamline for data collection. Send an email to Kathryn Burnett with federal Express shipping information so she knows the sample is coming and so she can track the sample online. We recommend not using detergents in entire protein preparation. We observed only a few cases (~1%) where the detergent ( below CMC concentration ) did not affect the protein signal. The most common problem at the beamline is aggregation in the sample. Since larger particles scatter X-rays more strongly than small particles (albeit less than visible light scattering), aggregation will bias the results. We strongly recommend doing either DLS, native gel, or gel filtration (best). If your sample has a tendency to aggregate over time, it is possible to prepare the sample at dilute concentrate and then concentrate just prior to data collection. The higher the concentration, the better the signal. However, there's a balance between problems with aggregation/oligomerization at the higher concentrations, unless the macromolecule is well-behaved. We generally recommend 1-5 mg/ml and doing a concentration series. If we are given 50 ul, we can do serial dilutions. Homo-oligomers can give okay signal down to 1 mg/ml. Ideally data should be collected on at least three different concentration of the macomolecule in the range 1-10 mg/ml to identify any concentration dependent behavior. Aggregation precludes data analyses. Concentration determination: OD280 is considered the most accurate although buffer subtraction is very important (oxidized DTT has an absorbance at 280). We have a nanodrop at the beamline (2 ul sample vol), and we recommend taking conc. right after removal from dialysis. Please verify that your conc. is correct--overestimation is a common problem. 96 well plate sample format. Our beamline operates with a pipetting robot, which works with 96 well plates. The samples can be shipped in fast frozen state in the single concentration with minimal volume 24uL . We strongly recommend dialyzing sample. The difference between the scatter of the macromolecule and buffer is so low, that simply making up the "equivalent" buffer is not sufficient to get accurate subtraction. To retain sample volume, we have found that the Hampton dialysis buttons (eg. 30-50 ul size) are ideal at keeping the volume constant. If you haven't used the buttons before, practice with saran wrap. Hampton has a nice set of instructions--many beginners fine the golf tee to make the difference. To remove the sample, we use a Hamilton syringe with a blunt needle, pierce the dialysis membrane, and remove the sample. We usually lose only a couple ul. The dialysis buttons fit well into 50 ml tubes--I have crammed in 7-8 in the same tube. The 50 ul volume allows us to do serial 1:1 dilutions. The buffer in the concentrator flow through is also good for subtraction (depending on your buffer components). Salt increases the background, but we've gotten good signal with up to 1 M salt. Concentration of the macromolecule has more of an impact on signal than the buffer, so if the sample is monodisperse in high salt, put it in high salt. 1-5% glycerol cuts down quite a bit on radiation damage, although we've also seen oligomerization induced by addition of glycerol. If you have the quantity available, trying several different buffers is recommended. For a start, ideal buffer might contain 100-200 mM salt with 5% glycerol. Please send at least 15 mL of buffer with your sample. 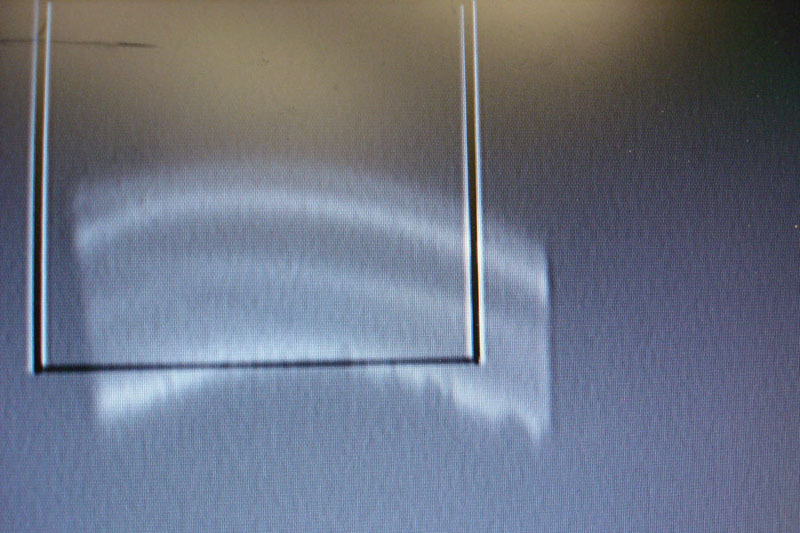 This happens, maybe 1 in 10 samples we observe changes in the SAXS scattering curve due to radiation damage. We've found that complexes do seem more stable, so if you have a complex, then throw that in as well. Glycerol is a pretty good radical scavenger, so 5% glycerol is good. 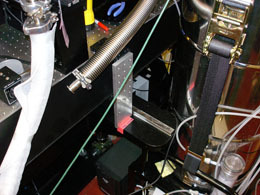 The beamline is equipped with Peltier that can vary the temperature from 0 deg to 50 deg. 1. Label tubes uniquely so that when they are stuck in the frig with many other tubes, they don't get lost. Recommend your initials with a number (eg st1) and date of sample. e. Sample concentration done on concentrated sample and what method used. Sample cell has flat Mica windows. We generally keep our Pilatus 2M detector at 1.5 m distance. We have developed a time slicing mode for collection. Each sample is collected multiple times with the same exposure length. We generally collect every .3 seconds for a total of 10 seconds resulting in 30 frames per sample (though there is some variation depending on beam optimization). The time of the short exposure is selected to minimize detector overloads near beam stop but to provide accurate measurement close to the beam stop. 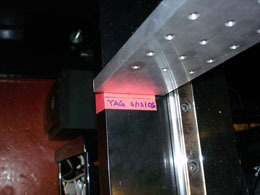 The long exposure is generally ten-fold longer to accurately measure high angle data. We can change the X-ray wavelength to optimize for sample size, although 11 to 13 KeV is generally fine for most samples under 40-150 kD MW. Qmin should be collected at an angle < pi/dmax. Detector parameters however must be calculated for each wavelength (we use silver behamate), so if you want to change the wavelength, please advise the beamline scientist. 2. We use xmgrace to visualize the scattering curves. 3. Preliminary analysis using PRIMUS and Gnom during data collection (from Svergun's group) is extremely helpful in determining the quality of your data. If your data is not good, subsequent analysis will be inaccurate. PRIMUS-guinier analysis indicates aggregated sample (increasing and non-linear slope towards I0). I0 estimate also good for estimating molecular weight using known standards (MW is linear with I0/conc). PRIMUS-porod analysis gives rough estimate of molecular weight (porod volume*1.2/2 ~ molecular weight). PRIMUS--SASPLOT (I*S^2 vs S) gives indication of folded nature of molecule. For example, well folded proteins show parabolic curve that returns to baseline. Unfolded or random coil molecules will increase with angle. Please note that too dilute sample and poor signal at high S or inaccurate background subtraction will also give this result. GNOM--p(r) analysis. Aggregated sample will have unstable Rg and p(r) curve will have small bump close to Dmax.